From John Landis is one of the funniest comedies ever as its interpretation of Prince and the Pauper is set in the world of finances where two ultra-rich commodities broker-brothers make a bet in changing the lives of one of their rich employees and a poor, homeless man and see how their lives turn out. 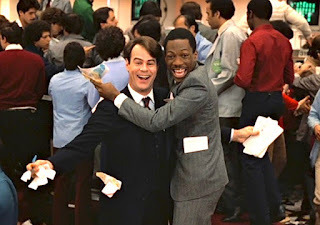 Though it’s not really about finances, it does contain a lot of ideas into the financial world such as its climax where both Dan Aykroyd and Eddie Murphy both team up to get revenge over this bet that affected both of their lives. From J.C. Chandor is one of the finest debut films of the 2010s so far as it explores the financial crisis of 2007-2008 in the span of 36 hours in which a group of people learn about what happened and what they can do to save themselves. It’s a film that is quite complex with a large ensemble cast yet it is about the human drama and what they’re dealing with as it’s not just that they’re losing their jobs but also finding someone to blame. It’s a very compelling film that is hard to get into at first but it does pay off in the end. From Adam McKay comes this adaptation of Michael Lewis’ novel that is also about the 2007-2008 financial crisis. Yet, it’s a multi-layered film that explore three different storylines in which a group of individuals would make some serious discoveries that would impact the world of finances. With a great ensemble cast as well as some very humorous cameos from celebrities that explain some of the complexities of finances, it’s a film that showcases a sense of humanity in a group of people just trying to make sense of everything that went wrong as well as deal with immorality that comes with capitalism. All three good choices and we have a match! Trading Places is such a fun film. Murphy and Ackroyd are terrific but I get a bigger kick out of old pros Ralph Bellamy and Don Ameche using every trick in their considerable bags of tricks to make their characters memorable. 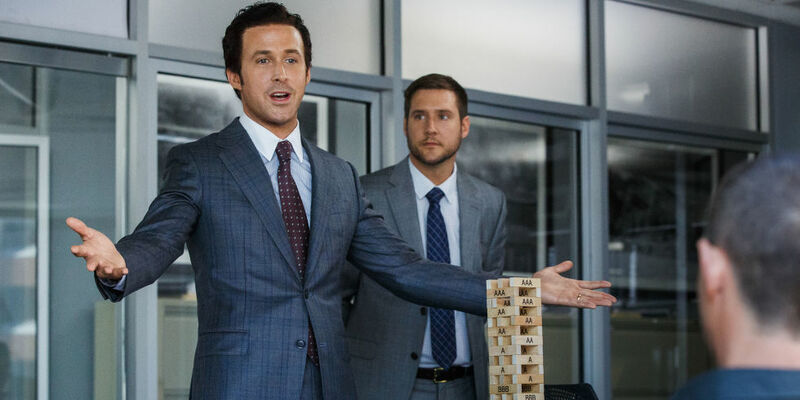 The Big Short does a fine job of making the crisis clear to the viewer whether they are money savvy or not but I like Margin Call somewhat more. I can't put my finger on precisely why but such is movie viewing. I also went with one 80's comedy and two dramas but one of mine is from way, way back. Margin Call (2011)-When the head of risk management (Stanley Tucci) of a large Wall Street firm is unexpectedly laid off he tries to alert someone in the company of the project he was in the midst of that showed troubling evidence of an incipient mass failing of many money markets. He is met with total indifference so on his way out the door he hands the info to one of his assistants who is staying (Zachary Quinto). Intrigued at first and then dumbfounded by what he discovers he finally manages to attract the attention of the higher ups. As a series of late night conferences take place the dawning revelation becomes apparent that a global financial meltdown is set to occur and there is not a damn thing that can stop it. A well-directed look at the immediate lead up to the 2008 financial crisis. Working Girl (1988)-Mike Nichols directed comedy about ambitious Tess McGill (Melanie Griffith-never more appealing) who despite her college degree and keen intelligence has trouble getting ahead. She goes to work as secretary to Ivy League Katharine Parker (a priceless Sigourney Weaver) in mergers and acquisitions at a large Wall Street investment bank. Lulled into a false sense of security when Katharine seems to extend a helping hand she tells her a provocative idea for a merger that she’s come up with. Katharine without a shred of shame steals the idea behind her back. 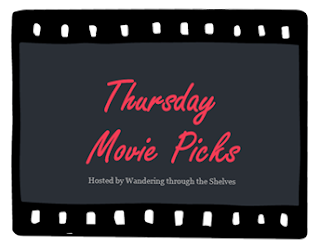 When circumstances allow Tess to become aware of the duplicity she uses subterfuge teaming with the unaware Jack Trainer (Harrison Ford-sprightly and relaxed) to bring the plan to fruition for herself. All does not go as planned. One of the rare comedies about the financial world that works. The Crash (1932)-Racy pre-code about Geoffrey and Linda Gault (George Brent & Ruth Chatterton-married in real life at the time), a rapacious couple who go to great lengths to accumulate wealth on the stock market up to and including Geoffrey encouraging Linda to pimp herself out for tips that can add to their fortune. She goes along because she can’t bear the thought of returning to the poverty of her youth. However when Geoffrey angers her with a request, she picks the precisely wrong time to hand him bad information and they are wiped out in the stock market crash of ’29. Staying together in name only while he tries to pick up the pieces she, haunted by her fears, continues to have gentleman friends who give her expensive things until a turning point is reached. Brief (only 58 minutes) and candid with a frankness that would vanish for decades with the implementation of the Production Code the next year. 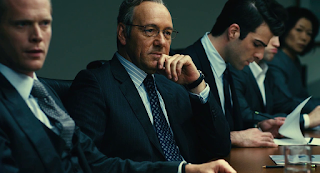 How do I not know about Margin Call? WHEN DID THIS HAPPEN? We match with Trading Places! I love this movie with a great cast. I didn't see Margin Call but I did see The Big Short. It was a good movie but, I have to admit, I had a hard time following it. I could never work on Wall Street. I was expecting The Big Short to be better but overall it wasn't bad. I can't believe I still haven't seen Trading Places. Margin Call is popular today! I wish I would've liked that movie more. The Big Short is great. @joel65913-I love Working Girl as it's one of my favorite films by Mike Nichols and it has Melanie Griffith in her best performance of her career though I have a soft spot for her work in Cecil B. Demented. @Birgit-With The Big Short, those celebrity cameos actually helped things out in explaining what is happening as it definitely carried a lot of weight to things that are complex. @Sonia-See Trading Places, it is hilarious. @Brittani-Margin Call I can understand isn't for everyone due to its subject matter but it is still a strong ensemble film. @vinnieh-That would've been an easy choice but that film was ruined by that horrible sequel.